Who would've thought that those green bomber jackets that were all the rage in the 90's are back with a vengeance?! Now with its comeback you can find new designs like printed, floral, embroidered or even denim bombers, but I still stuck to the classic green with orange interior for a bit of nostalgia- oh the memories of being young again, all that is missing are the Doc Martens! I did however go for an updated silhouette via this A'GACI longline bomber jacket that is longer than the typical bomber and bit oversized (which I totally like). I paired it with distressed denim and cut out booties for a bit of a street feel! loving the army green! xO! 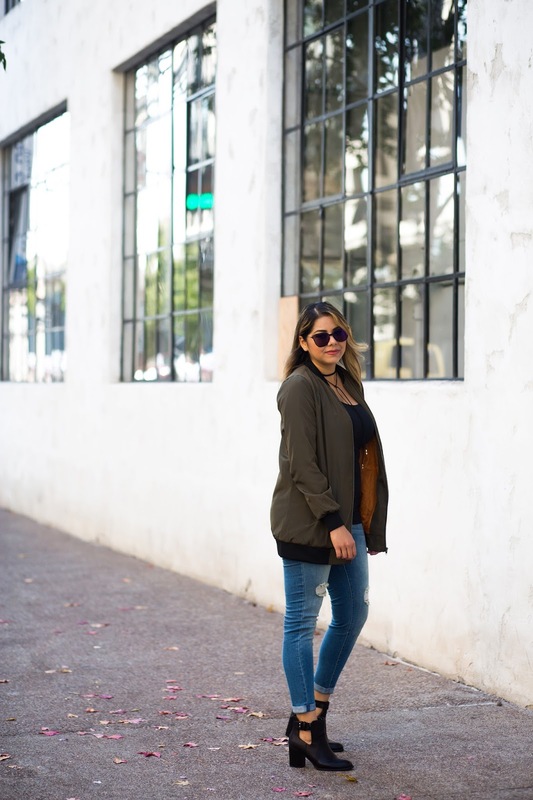 You combined the bomber jacket in a cool way! This outfit looks great - I love the color choices on you. You can never go wrong with a nice olive green :) I also love your lariat choker...I'm going to have to check that one out as I've been on the hunt for one!